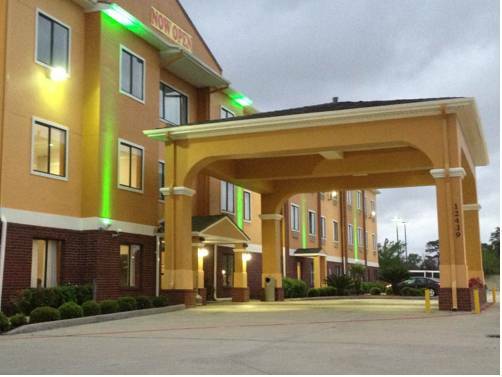 Get more for your money at the Quality Inn and Suites Hwy 290-Brookhollow hotel in Houston, TX off Highway 290 and Interstate 10, 20 minutes northwest of downtown Houston. This pet-friendly, smoke-free hotel is located near destinations like the Children's Museum of Houston, Sam Houston Race Park, Rice University, The Galleria and NRG Stadium. Take advantage of amenities like free hot breakfast, free WiFi, fitness center, a 100-guest meeting room and copy and fax services. Rooms include HDTV, microwave, coffee maker, hair dryer, iron and ironing board. Also, earn rewards including free nights and gift cards with our Choice Privileges Rewards program.